All the required things were there in the property. Very clean. The apartment is centrally located in a quite street, nearby the Belvedere palace complex and gardens. The appartment is close to public transport (train, bus, tram) that takes approximately 15 minutes to the city centre. Safe and quiet neighbourhood. Walking distance to train station, bus and tram stops. Kitchen fully equipped for easy meals in. Alexander the host was very helpful and easy going. Beds were quite comfortable. L'appartamento è collegato abbastanza bene con i mezzi per arrivare al centro, inoltre essendo stati a Vienna in Dicembre era ben riscaldato! Majitel byl na miste jeste pred nasim hlasenym prijezdem. Ackoliv nam prijezd potvrzoval na 16.00, byl na miste jiz v 11.00 a volal na mobil. Nastesti jsme byli jiz na miste a nedaleko, tak predani klicu probehlo v poradku. Asi 300 metru od apartmanu placene parkoviste (5 EUR na den), rovnez mestska doprava..tram a S1. Központi helyen van, gyalog minden megközelíthető a centrumban. Dobra lokalizacja blisko do przystanku tramwaje około 200 m I jedzie do rynku ok. 7 minut. Pięknie rynek. Blisko sklep Lidl I wygodne parking przy ulicy (ale płatne pon.-pt.) a weekend za darmo. Pokoje są dobry I wygodne łózko. Piecyk w pokoju. . Cozy Barich Apartment, located in Vienna’s 3rd district, is a modern studio with amenities like free WiFi and a flat-screen cable TV. The property is a 10-minute walk from the Ringstraßen Boulevard and the Vienna City Park. The Belvedere Palace is 2,300 feet away and the closest tram can be reached within 3 minutes on foot. The studio apartment consists of a spacious living and sleeping room with a sofa bed and a dining area, a fully equipped kitchen with a coffee machine and a fridge, and a private bathroom. Shuttle services can be requested at Cozy Barich Apartment and the studio’s building is fitted with a elevator. St. Stephen's Cathedral is a 15-minute public transport drive away and the Schönbrunn Palace can be reached within 30 minutes. The Rochusgasse Underground Station (line U3) is a 10-minute walk away. When would you like to stay at Flatprovider - Cosy Barich Apartment? 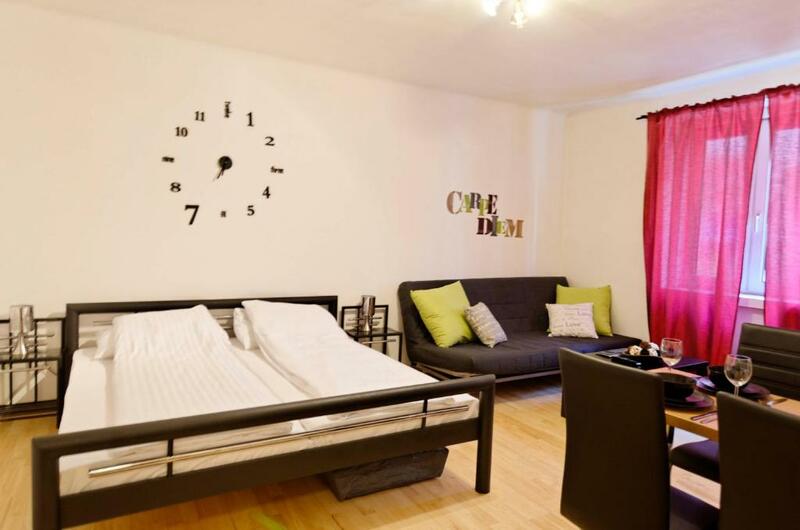 House Rules Flatprovider - Cosy Barich Apartment takes special requests – add in the next step! Flatprovider - Cosy Barich Apartment accepts these cards and reserves the right to temporarily hold an amount prior to arrival. Please inform Flatprovider - Cosy Barich Apartment of your expected arrival time in advance. You can use the Special Requests box when booking, or contact the property directly using the contact details in your confirmation. It's not comfortable to take shower. The property had a strange smell. It was located on the ground floor, thus providing a limited level of privacy. The cleaning fee is quite high, especially if you stay only one night. It was untidy and it was lack of cleanliness. The bathroom is in a terrible condition (mold, broken tiles, no shower curtain) and smelled during our entire stay (mold, sewer, dampness). The flat is on the ground floor with the window towards the street, so it is not possible to leave the window open for fresh air. The only heating in the room seemed to be a gas stove => would not like to be in this appartment in winter. The apartment itself is a bit old and run down. Could do with a doing up. Bath tub is quite small with no water outlet and shower curtain so the whole bathroom would get wet after a shower. Horribel condition. The bathroom was dirty and filled with mold. The toilet was not attached to the floor. Advertised with free parking - is not true! Parking will cost you 26 euros a day. Look for apartments with free/cheap parking instead. This apartment is simply to lousy. The walls were dirty, the tv channels werent there because of a cheep tv box and the kitchen were dirty and falling apart. Near central town. No more god to say!